Raise awareness of internationalisation among the administrative staff of European universities. Create a multiplying effect and help institutions enhance management, governance and innovation capacities in order for them to become truly international. Share know-how, course materials, manuals and results of the project to all interested HEIs. European report on systemic university changes towards internationalisation. Development of the different courses: Train the trainers, in-house trainings and open seminars. Trainer’s manual and teaching materials. Creation of an International Network of SUCTI Trainers in Internationalisation. SUCTI European Virtual Resource Center. 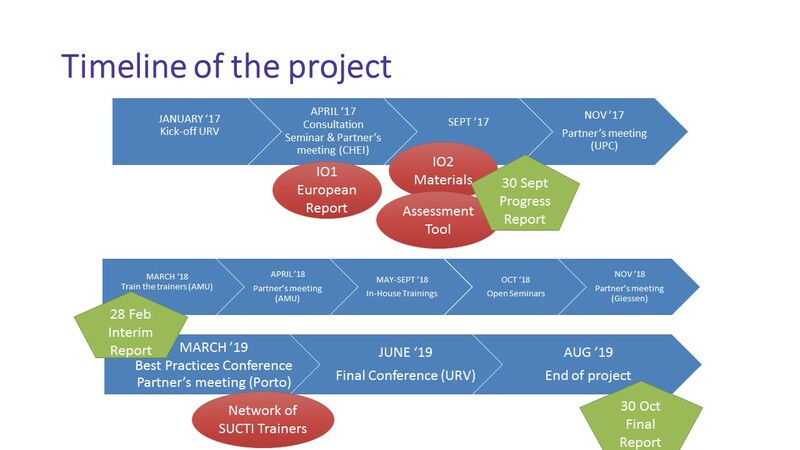 Coordinator of the SUCTI Project, Marina Casals Sala, Director of International Relations at Universitat Rovira i Virgili (Spain), gives an overview of this Erasmus+ Strategic Partnership project. Fiona Hunter, Associate Director of CHEI, on the role of administrative staff in the internationalisation process and how the SUCTI project focuses on how to activate their potential.